This month, Lin-Manuel Miranda will don his frock coat, tie back his ponytail, and take the stage as "10-dollar Founding Father" Alexander Hamilton for the first time in nearly 3 years (the composer-actor left the original cast of the Broadway juggernaut Hamilton shortly after the show swept the Tonys in June 2016). Hamilton will have a 3-week run at the University of Puerto Rico's main campus in San Juan to help revitalize the island's artistic community after the devastation of Hurricane Maria. Miranda, who also authored the Tony-winning In the Heights and penned the music for Disney's Moana, has used his skyrocketing fame to serve many causes. He's filmed public service announcements urging people to register to vote in the 2018 midterm elections, spoken out against the separation of families seeking asylum at the U.S. border, and raised funds through his TeeRico merchandise store to combat climate change and support March for Our Lives and Everytown for Gun Safety. But perhaps nothing else stirs Miranda's passion quite so powerfully as Puerto Rico, the U.S. territory where his parents were born and which has suffered so much tragedy since the hurricane hit in 2017. Original estimates put the death toll at just 64, but a George Washington University study commissioned by the local government and released in August 2018 put the total at 2,975 lost lives -- more than Hurricane Katrina. Many of the deaths were avoidable, linked to a lack of emergency and relief services and a full year of power outages. "The power grid is key to everything, and so many of the heartbreaking stories we're hearing about were preventable," says Miranda. "There weren't fridges around for medicine. Health centers were without power." In the first 6 months after the hurricane, the Puerto Rico Primary Care Association, which represents the 20 federally qualified primary health centers that are the main source of care for vulnerable populations on the island, reported more conditions like conjunctivitis (eye inflammation), respiratory illnesses such as asthma, and gastrointestinal disease. Today, says Alicia Suarez, the association's executive director, mental health represents the biggest crisis on the beleaguered island: "The level of stress is enormous. On the second weekend in September alone, we had six suicides on Puerto Rico. Between January and September 2018, there were 151 suicides." As part of his hurricane relief efforts, Miranda works with the Hispanic Federation, a nongovernmental organization that has given a lot of support to Puerto Rico's recovery. His father, Luis, is the group's founding president. To aid in the recovery, Miranda has raised millions through TeeRico and his star-studded single "Almost Like Praying." "Through the Hispanic Federation, we've been working on providing solar energy for health centers so if everything goes down again -- it's a very fragile and outdated power grid, and I'm not confident it got fixed post-Maria -- there will still be medical care available," he says. "In some parts of the island, it's business as usual, and in other parts there are still no traffic lights. Everyone's still going on the honor system, and that's become business as usual, which is very sad. In some ways, it's back to normal, and in some ways, it will never be normal again." The Puerto Rico Primary Care Association, the Hispanic Federation, and other benefactors have also set up a telemedicine initiative and mobile health units to reach isolated mountainous and rural parts of the island. "With every donation, from medications to diesel engines to gas generators to solar panels and now even satellite Internet connectivity, we are building a new backbone for health care in Puerto Rico," says Suarez. Miranda, who invited Hamilton audiences to reimagine an early America in which such icons as Washington and Jefferson could be people of color, seems to have his hand in an endless array of projects these days. At the time of this interview, he was packing up with his family -- wife, Vanessa Nadal, an attorney and scientist, and two young sons -- for 2 months in Wales filming the BBC's adaptation of Philip Pullman's His Dark Materials. Miranda will play balloonist Lee Scoresby. He's also directing a film version of Rent composer Jonathan Larson's Tick, Tick... Boom!, producing an FX series about Broadway choreographer and dancer Bob Fosse and Gwen Verdon, bringing In the Heights to the big screen, teaming up with Disney legend Alan Menken to write new songs for a live-action movie of The Little Mermaid, and releasing Gmorning/Gnight, a book collection of his inspirational, life-coachy daily tweets. (Miranda is prolific on Twitter and will often announce that he has a few moments of down time to answer fans' questions.) And last month, the long-awaited Mary Poppins sequel finally hit theaters, starring Miranda as Jack the lamplighter opposite Emily Blunt's magical nanny. But Miranda is quick to explain that each project "works different muscle groups" and that he's not really working himself into an early grave. "I have a lot of help. I sleep. I take my kids to school and tuck them in each night. I'm not some kind of sleep-deprived tortured writing animal," he says. "Some days, I feel like I'm constantly trying to kick the pedestal out from under me that people are trying to put there." The Gmorning/Gnight book came about as a result of the Internet. "There's no magic behind that. All I'm writing is what I wish someone would tell me that morning. If it's about anxiety, I'm probably feeling anxious. If it's about 'pace yourself,' I probably put toothpaste in my coffee," he says. "The more personal I get, the more it resonates -- which is an amazing lesson as a writer. Those are written and done, and all that's left is for people to have it." A biography of Fosse and Verdon, written by Miranda's Wesleyan classmate Sam Wasson, inspired the upcoming FX series. "I put it in the hands of Tommy Kail [a director-producer and frequent Miranda collaborator] and Andy Blankenbuehler, our choreographer from Heights and Hamilton, who's as close to a modern-day Fosse as I know," he says. "That's not really work for me; it's helping put talented people together in a room and saying, 'OK, keep going.' "
Of Tick, Tick... Boom!, he says, "I know I'm going to have to wait to make it, because I want to make sure the screenplay is everything it can be. We really just started kicking the tires on it in earnest, and I don't think it'll get into production until late 2020. And playing Lee Scoresby feels like a vacation, even though it's hard work, because it doesn't require any part of my brain to be writing. So when you look at it that way, it's not really all that much at once." Part of the reason Miranda's fan base is so vast and devoted is his goofy, self-deprecating personality -- he's a West Wing geek (the Hamilton line about "looking for a mind at work" was lifted straight from the series), and he once told Conan O'Brien that he totally freaked out upon meeting "Weird Al" Yankovic, saying "I have no chill whatsoever." It's as if he is simultaneously the hippest and the dorkiest guy in the room. "It would take so much more energy if I had to pretend to be cool," he says. "I don't know how to do that. I feel very lucky that Hamilton came along at a time in my life when I already knew who I was. I was married, I had a kid. When you have that level of success as a person and you're still trying to find out who you are and what you want to be in the world, it can knock you off your feet in a very real way." "Of course, I could still get knocked off my feet at any second," says Miranda. "Let's not predict anything!" Helping keep Miranda on an even keel is his wife, Nadal, whom he praised as "the reason everything gets done" in his heart-wrenching "love is love is love" speech at the Tonys shortly after the Pulse nightclub massacre in Orlando, FL. His high-traffic Twitter feed is punctuated with mini "one-act plays" featuring dialogue from the Miranda household, which often involves Nadal keeping any sign of ego from her husband firmly in check. "Vanessa is an absolute superhero who manages to do her own legal work while still nursing a baby," he says. "She's also not really a theater person. So if I've written something and she likes it, I know I've cleared a higher bar than someone who loves show tunes full stop. If Hamilton has gone beyond the base of people who like musical theater, it's because of her." The couple is still adjusting to life as parents of two. "We're not outnumbered, but our attention can be split," he says. "The baby is still very dependent on us, and the 3-year-old is testing boundaries all the time. The 'threenager' thing is real! There can be nights she's with the baby and I'm with the older one, and we both fall asleep without checking in because we're freaking exhausted! So we really have to focus on taking the time to be with each other and not let drift happen. That's the foundation, not only for our kids, but for ourselves." To ensure that he's fully present for his family, Miranda enforces a "no Twitter on the weekends" rule, deleting the app from his phone every Friday night and reinstalling it Monday morning. "It's an absolute addiction, and this is the only way I know to really not do it," he says. "And then I go into the week with energy because I've had the weekend off." In the face of a seemingly relentless barrage of negative news, whether on social media or anywhere else, Miranda advises his fans to look for opportunities to create good. "When we were filming Poppins, it made me so happy to know that whatever was going on in the world, we were creating something that will provide escape and joy for people," he says. "There is no shortage of challenges in the world, but there's also no shortage of ways to do good. Dedicating a little part of your day to doing that, in your backyard or out in the world, takes away the helplessness and the tide of it all." 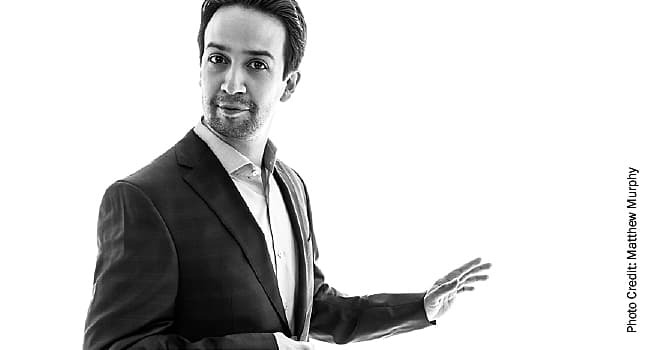 You may not have won two Tonys, two Emmys, and a Grammy like Lin-Manuel Miranda -- but like him, most people must manage the daily stress of juggling more commitments and deadlines than they can keep up with. Steven Southwick, MD, the Glenn H. Greenberg professor of psychiatry, PTSD, and resilience at Yale University Medical School, says that although we typically think of stress as being a bad thing, humans need stress. "It keeps us alive," he says. "It gives us the energy to accomplish the tasks we need." But to manage this stress in an out-of-control world, what we need is resilience -- the ability to bend but not break under great pressure, and in some cases even grow as a result of that pressure. "Resilience is learning to recover from stress and harness it," Southwick says. Mindfulness meditation. Repetitive practice of mindfulness meditation helps you gradually learn to be in the present moment and not constantly anticipate what stressful thing is coming next. Reappraisal. Reappraise what feels threatening and see it as more of a challenge. "We have all these stressors facing us every day. When possible, try to look at them and say, 'Can I learn from this and become stronger?' " he advises. Finding purpose. Southwick agrees with Miranda that finding a meaningful pursuit "outside yourself" helps to ease stress, even if it adds a little to your commitments. "Working with a cause, something bigger than you, eases that sense of helplessness," he says. A strong social network. "It can be tempting to withdraw from your social connections when you're stressed, but that's the worst thing you can do," says Southwick. He recommends drawing a map of your own social network and identifying who you can count on -- and who can count on you. "Giving social support is as powerful as receiving it," he says. Exercise. "Exercise helps to repair neurons in the brain in areas that control our stress response," he says. "It improves mood and concentration and cognitive abilities." Role models. "All resilient people have role models," says Southwick. "Look at friends or people you admire, who handle stress well, and then think about how they do that." Steven Southwick, MD, Glenn H. Greenberg professor of psychiatry, PTSD and resilience, Yale University Medical School. NBC News: "Puerto Rico states hurricane-related deaths could be at least 1,400."